Last night I received a link to a blog called ‘locks and security’. The first thing that came to mind reading ‘locks and security’ is that it would have something to do with Marc Tobias, author of ‘locks, safes and security’. But Marc’s new informative weblog is called ‘the sidebar’. This ‘locks and security’ weblog is clearly something else, but nevertheless a very good source of information. 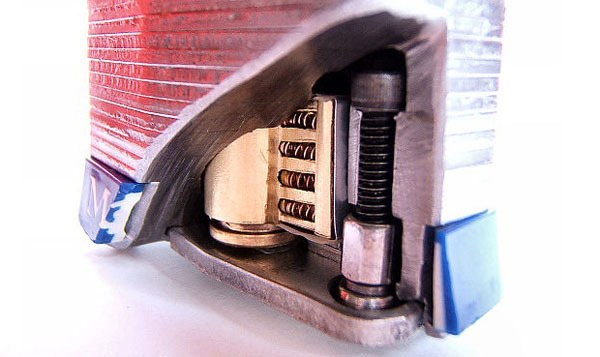 It shows the author’s drive for knowledge and passion to change normal locks into the lockpickers most desired object: the ‘cutaway lock’. I really like the way he shares his thoughts on ‘plan of attack’ to certain locks and his great eye for detail. And to read he will phone fifteen different locksmiths trying to get his hand on a specific lock part for a fair price. Personally I would have tried to visit the shops instead of calling them. Although calling is a lot faster, having face to face conversations can be much more productive. Reading ‘safe and security’ reminded me of ‘the good old days’ were I as a 16 year old kid visited most of the Amsterdam locksmiths. Asking countless questions, most of the time being thrown out of the shop without answer. However, if you just keep on trying, and learning from your mistakes, you will find someone who will recognize your talent and share your passion for locks. At age of sixteen I already made some friends with locksmiths that still are close friends and valuable contacts to this day. This entry was posted on Saturday, June 9th, 2007 at 10:54 and is filed under Uncategorized. You can follow any responses to this entry through the RSS 2.0 feed. You can leave a response, or trackback from your own site. Thanks a lot Barry for putting the site on the front page ! This is a blog run by a friend of mine who’s skill at making some unbelievable homemade cutaways is unparalleled, do check it out you won’t be disappointed. Credit where credit is due, Julio.